Cloud Based Mobile App Development can be coded easily for the back-end. It is the Front-end which creates confusion to many. 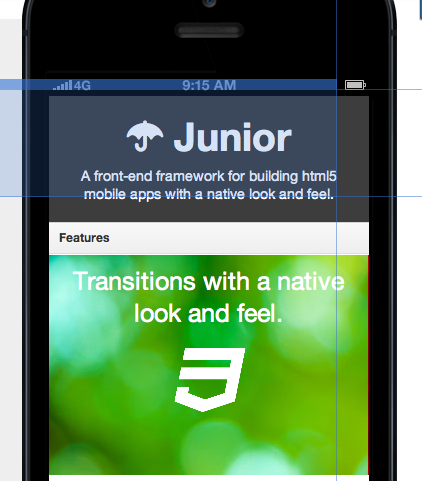 Junior is front-end framework. Junior is a nice HTML5 Mobile framework for your next Cloud Based Mobile App Development with CSS3 Transitions, Swipable carousels and many features. In this short introduction guide on Cloud based mobile app development, we will introduce Junior framework to you, which is definitely a Free Software. As we pointed through various articles before, Cloud based mobile app development is becoming more and more development – it can be just for your website, your shop or your other service over the Internet. API is nothing new, but Cloud Computing and Mobile apps has increased its usage and pushed towards its success. Previously we pointed that, Cloud Computing and Mobile Computing are becoming Over Merging Technology, day by day. Example of an excellent integrated mobile app development can be Locitron – A Free, Cloud Based Mobile App for Keyless Entry. At any point, either as a serious webmaster or a service provider, it is becoming more and more important to develop platform based mobile applications and the role of HTML5 front-end can never be ignored. Three obvious questions are arising in your mind, those obvious – first is, where is the repository; second is how to get started with your own Cloud Based Mobile App Development and the third is, where to host. The answer to the third question is – using a separate server instance of Node.js or any suitable framework you need either on free PaaS like App Fog or Heroku Cloud or Red Hat Open Shift – these are quite good freemium platforms to start with. You can definitely use IaaS like Rackspace Cloud Server with hourly payment option for more control. The answer to the second question is partial in this article, because we have to highlight Junior specifically in this introductory article – you can use the simulator of Junior to test your App. You can, for example use RSS feed or JSON to create an Pinterest looking App for your website. These can be very basic example with practically near zero load on server. The second one is example of API based call. This Article Has Been Shared 5906 Times! Cite this article as: Abhishek Ghosh, "Cloud Based Mobile App Development : Junior for HTML5 Mobile Apps," in The Customize Windows, January 24, 2013, April 21, 2019, https://thecustomizewindows.com/2013/01/cloud-based-mobile-app-development-junior-for-html5-mobile-apps/.